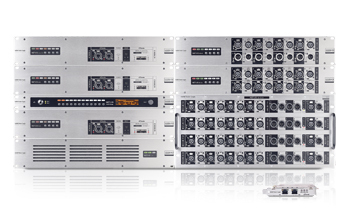 A comprehensive range of interfaces for Dante, AES67 and SMPTE 2110 audio networks. 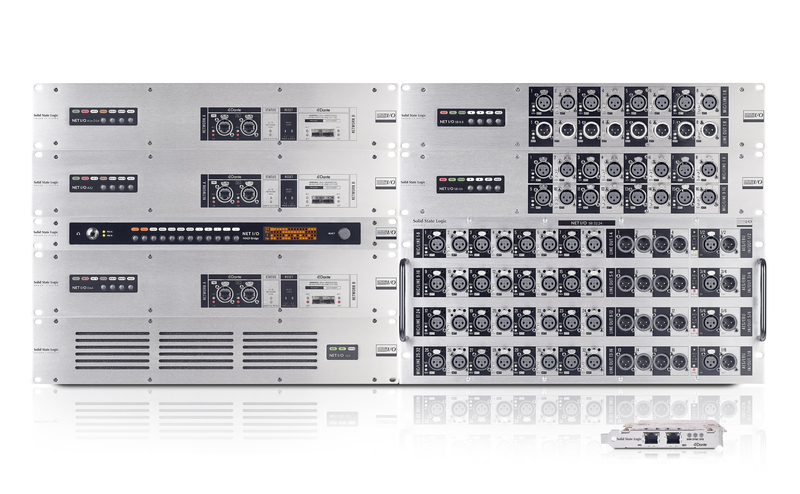 SSL Network I/O interfaces bring renowned SSL audio performance to System T and Dante, AES67 and SMPTE 2110 networks. They can be used as standalone solutions or used with System T to complete powerful facility wide systems.A range of devices offer mic/ line analogue, MADI, AES and SDI embed/de-embed capability wherever it is required. 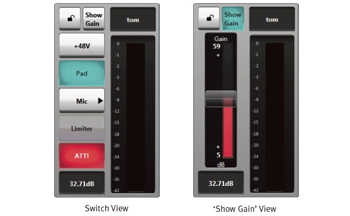 System T Control Interfaces and SSL Dante Control Software offer remote control over SSL mic/line I/O across the network. Superior SSL mic/line preamp technology for your Dante IP Audio Network. 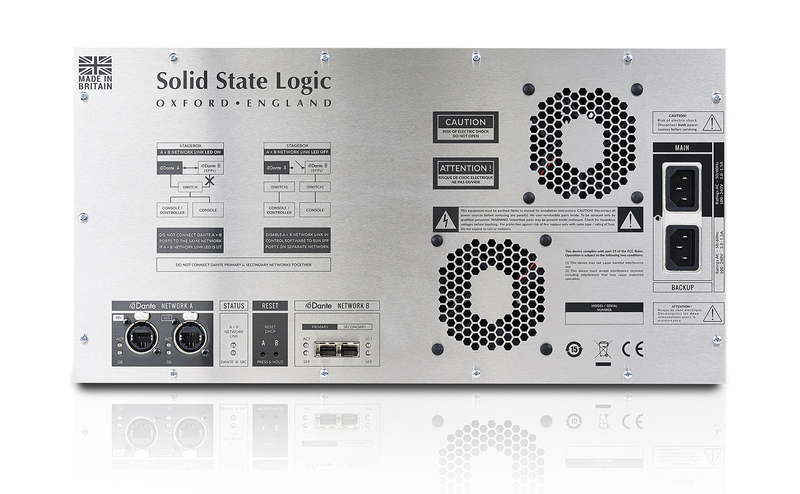 SSL Network I/O Stageboxes make SSL’s renowned SuperAnalogueTM preamp design with its superior audio performance available for a wide range of Dante network applications. play features allow devices to easily be moved, even between locations and retain routing and settings if required. All units can be remote controlled via System T broadcast consoles and control interfaces, SSL Live consoles, and the SSL Remote Stagebox Application. There are three different models available; SB8.8, SB i16 and SB32.24. These 2RU units offer slightly different configurations but share identical features. The SB 8.8 offers eight mic/line inputs and eight line level outputs. SB i16 offers sixteen mic/line inputs. Both models feature a pair of redundant RJ45 Dante network connections, a pair of network extension connections, GPIO connectivity and redundant PSU’s. They have individual signal present, phantom power and local attention LEDs to provide intuitive front panel feedback. 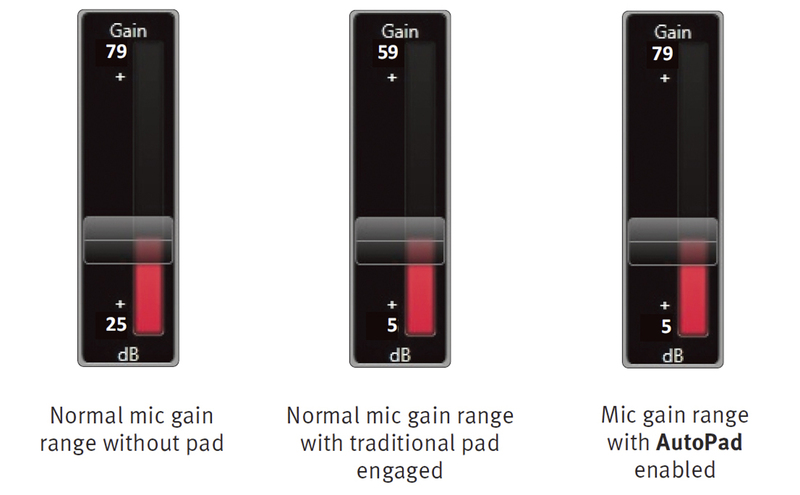 require a pad to achieve making the entire possible mic gain range seamlessly available at all times. 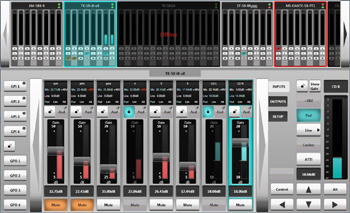 An Audition feature allows individual channels to be monitored over the network (using an SSL console or App) without the signal actually being routed to a network destination. 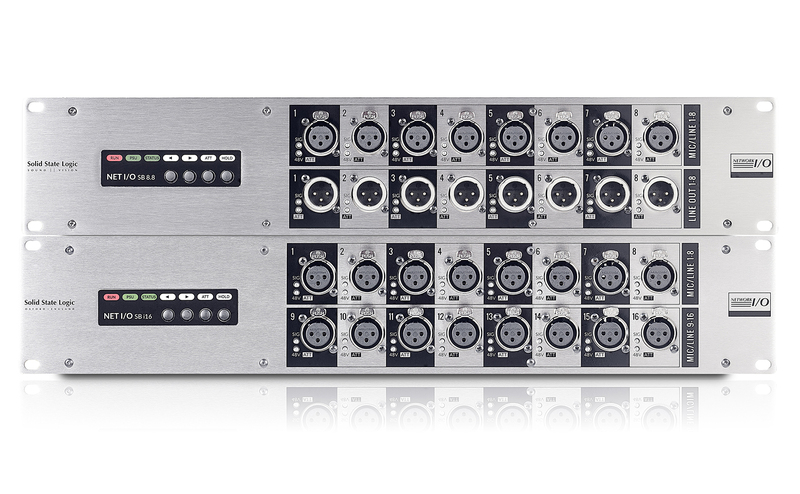 SB 32.24 is a 5U ruggedised enclosure featuring dual redundant power supplies, 32 mic/line inputs, 16 analogue line outputs and 8 digital inputs and outputs on 4 AES3 input/output pairs. It has a pair of redundant RJ45 Dante network connections in addition to a user configurable SFP port that can be fitted with RJ45 or optical connectors. These can be used for network extension or to provide network separation for the gaincompensated Dante “split”, for connection to a second Dante-equipped console or appropriately equipped device on a different network. It has individual signal present, clip and phantom power LED’s as well as global indication of PSU, Network A and B and Hardware status. 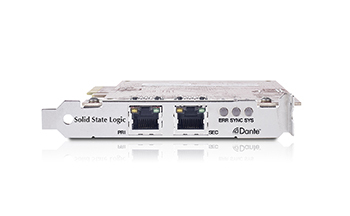 The SSL Stagebox Remote Control application provides comprehensive remote control of SSL Network I/O Stageboxes via a Dante network. The software can be installed onto any PC located anywhere on the network and multiple instances of the software can coexist on the network, with all instances of the application having access to all SSL Stagebox units currently available on the network. The Remote Control Application offers complete control over the extensive feature set of SSL’s Stageboxes and acts as a communication aid with clear real time device and channel attention indication. The Network View in upper section of the GUI shows each SSL Stagebox on the Dante network with large arrows to scroll through all SSL Stageboxes currently available on the network. A flashing red border indicates a specific device with a clipping audio channel, a solid red border highlights a device with an active Attention flag. Each device has redundant PSU status LED’s and is shown with the appropriate number of channels. Each channel has with individual level displays and Attention, Lock and Mute tallies. Devices that have been connected to the network while the application is running but have subsequently lost communication show as "Offline". Clicking a device brings its parameters into the Detail View. Shows and provides control over the parameters for a selected device. Individual channels have an Info overview box, a lock button which prevents accidental changes, level display, gain displays (which can be used for numeric editing), a fader (which is unavailable if the channel is locked) and a mute button. The GPIO controls are available to the left of the Detail View. Shows an expanded detail view for a selected channel with a full set of controls: +48V phantom power, Mic/Line select, Attention (which toggles the red status LED for the channel on the hardware unit), Gain, Lock and ‘Show Gain’ which toggles the fader into the Focus Window. The function of the Pad button is dependent upon the Pad Mode selected via the Setup page. In traditional Pad mode the button engages a classic -20dB pad. In SSL AutoPad Mode the button shows a change in status when the pad is automatically engaged but does not switch the pad. AutoPad is an innovative system that automatically applies a Pad according to gain setting. The pad is automatically included in the fader gain range and applied if the gain is set at a low value that would require a pad to achieve. 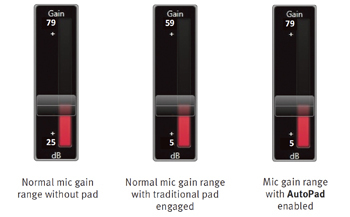 This allows the entire possible mic gain range to be seamlessly available at all times. A set of Navigation controls in the lower right corner of the GUI provide channel navigation and level controls that are mapped to your PC keyboard to provide immediate hardware control. ◂ ▸ Left and right arrows call the previous or next channel on the device to the Focus Window. At the first or last channel of each device navigation will transfer to the adjacent channel of the next device shown in the Network View. ▴ ▾ Up and down arrows alter the gain by 1 dB. Alt toggles the gain step to 3 dB. Control toggles the gain step to 0.1 dB. These keys and combinations are mapped to your PC keyboard. For example, pressing ALT+UP on your keyboard will increase the gain by 3 dB. The Setup Page shows an addition set of information and controls for each device. PSU and Fan status is shown alongside temperature readings taken at three locations within the Stagebox. Global operating level for the Stagebox can be set at a range of settings between 15dBu and 24dBu. 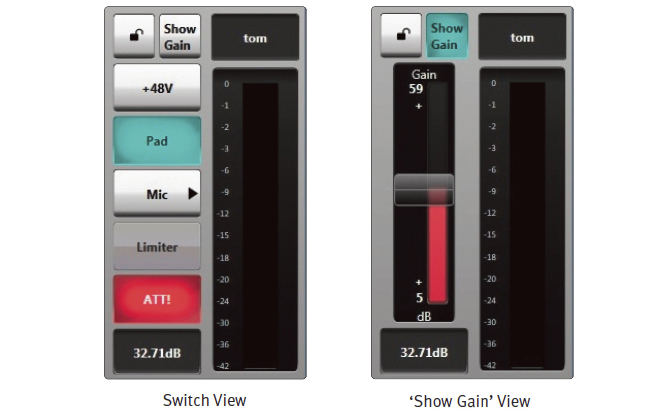 The AutoPad button toggles the Pad Mode between traditional -20dB Pad and SSL AutoPad. 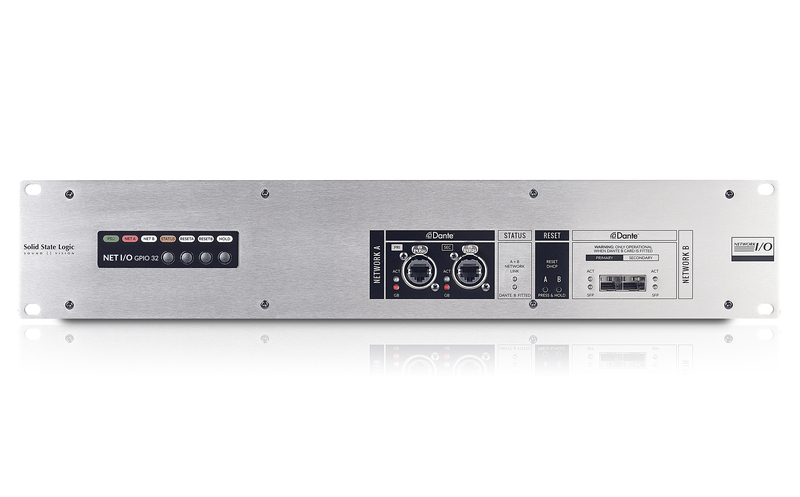 The A16.D16 provides a combination of SSL SuperAnalogueTM and AES3 digital I/O to Dante, AES 67 based IP networks. A16.D16 includes redundant network connections* and PSUs. 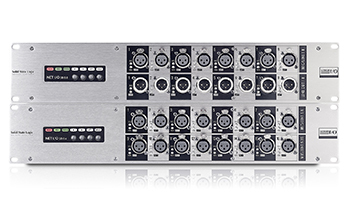 It features 16 line inputs - four of which also have switchable mic circuits, 16 line outputs and 16 digital I/O in 8 AES3 pairs. There are four GPIO. The A32 provides SSL SuperAnalogueTM I/O to Dante and AES 67 based IP networks. A32 includes redundant network connections* and PSUs. 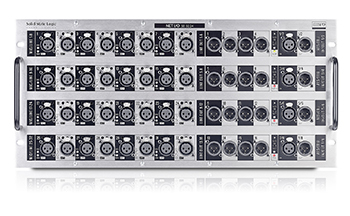 It features 32 line inputs and 32 line outputs. The SSL Network I/O: SDI provides bidirectional bridging between Embedded SDI Audio and a Dante IP Audio Network. 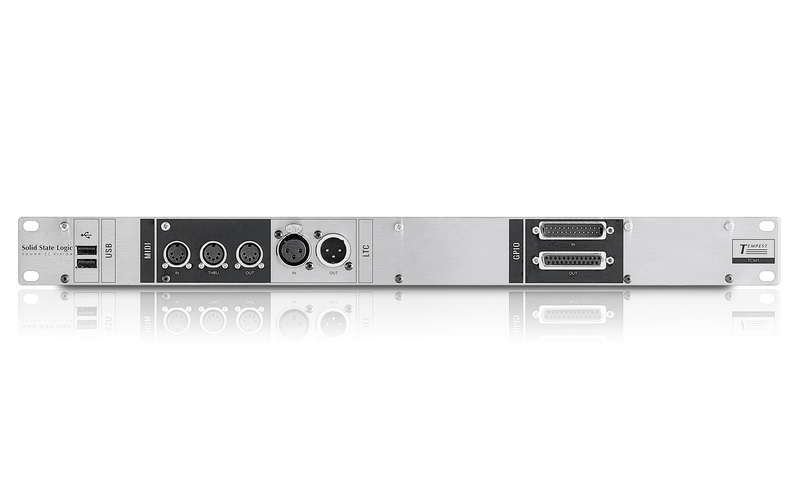 It has eight SDI circuits, each capable of Embedding and De-Embedding, and the unit has dual Dante and triple MADI connectivity (2 x optical, 1 x coax I/O). In addition to SDI-Dante bridging SDI allows direct bridging between SDI and MADI infrastructure. Internal channel-by-channel routing enables flexible routing between all three domains. As you would expect redundant PSUs provide reassurance in a 24hr Broadcast environment. The D64 provides 32 input/output Pairs of AES3 audio I/O connectivity to redundant Dante network connections*. Sample Rate Convertors allow seamless integration of unlocked AES sources. D64 includes redundant network connections and PSUs. 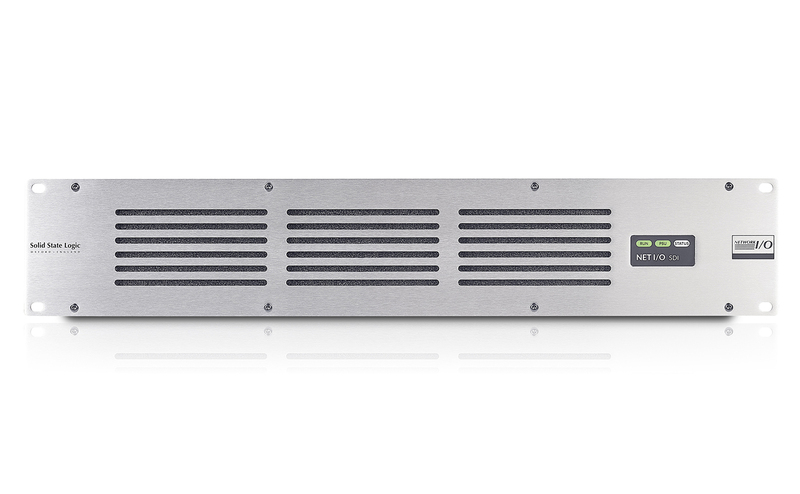 The SSL Network I/O: MADI-Bridge is a broadcast specification bridge between the industry standard MADI audio format and IP audio network's using Dante. The MADI-Bridge enables C100 and C10 Digital Broadcast Consoles or any other standard MADI device to connect to Dante based IP Audio networks with full redundancy maintained. 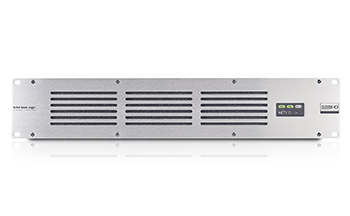 With 64 channels per Bridge (@ 48kHz) and up to 512 channels per 1GB network link, Dante is fully scalable and capable of providing routing channel counts from tens to thousands and beyond using standard IT infrastructure. Redundant PSU, MADI ports and IP Network ports mean the Bridge is built for uninterrupted operation, keeping critical devices and audio paths functioning throughout the broadcast facility. In addition to the inbuilt clock redundancy options in Dante controller, the MADI-Bridge also includes a pair of redundant sync inputs for use as a self-redundant Dante Grand master clock. 32bit MADI control tunnelling allows a pair of MADI-Bridges to be used to pass audio and user bits of a whole MADI stream across a network. Remote locating existing MADI Mics or increasing cost efficiency of an existing fibre cable beyond a single MADI stream is now a simple task. The Bridge also features Bidirectional sample rate conversion between any asynchronous sample rates, from 44.1kHz to 192kHz. 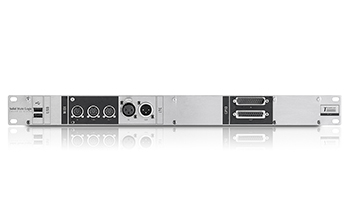 Intended for use with Dante controller and third party Dante products, the MADI-Bridge shows commitment to interoperability while understanding Broadcasters critical needs. 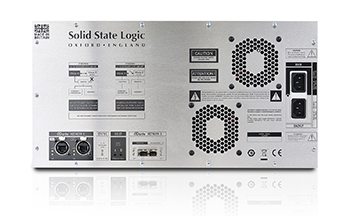 The SSL MADI-Bridge features a front panel headphone socket (with rotary level control) and inbuilt headphone monitor routing, to truly replace traditional patch bay confidence routing and fault finding functionality with equivalents in the IP Audio domain. Simple font panel controls facilitate routing mono or stereo paths from MADI In, MADI Out, Dante In or Dante Out directly to the headphones. A front panel LCD screen provides signal present metering selectable to show four points in the signal chain: MADI In, MADI Out, Dante In and Dante Out. GPIO connections allow for transfer of tally info and switching functions across the network with the Audio. Bidirectional sample rate conversion between any asynchronous sample rates, from 44.1kHz to 192kHz. Fully redundant high capacity Dante connectivity for your computer. 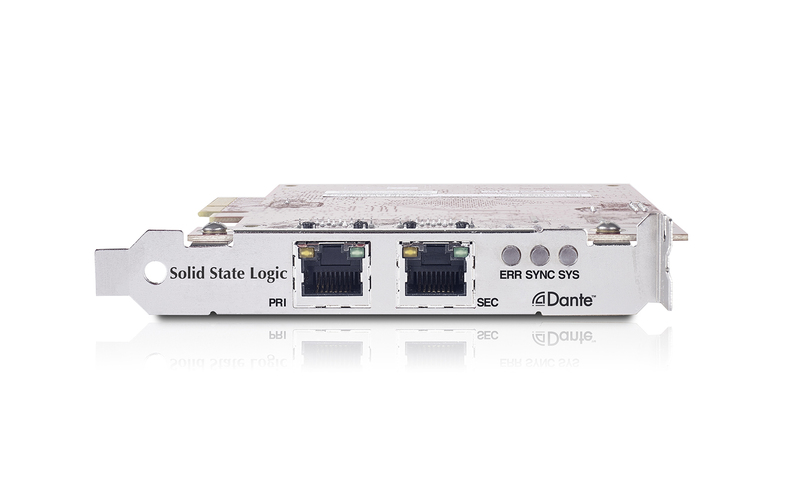 The SSL Dante PCIeR interface provides high capacity Dante connectivity to any suitably specified Mac or PC. It features Primary and Secondary network connections and streams up to 128 channels (at 44.1, 48 kHz, 88.2, 96 KHz) or 64 channels (at 176.4 or 192 kHz). Minimum latency and synchronisation is less than 1 μSec. The card is compatible with external PCIe chassis for laptops. Bulk GPIO for System T devices across your network. GPIO 32 provides bulk GPIO connections for interfacing with System T consoles and transporting GPIO across System T networks. It facilitates a variety of possibilities and applications for System T consoles, such as custom user key panels or complex Audio Follow Video setups. 32 GPIs and 32 GPOs are available from the 2U unit. GPIO 32 maintains the solid design and redundancy features found on the rest of the Network I/O range: redundant PSUs and redundant Dante network connections come as standard. When coupled with System T’s powerful Event Manager, GPIO 32 has endless possibilities for custom console functions and external triggers. GPIO 32 can be controlled from all variants of System T control surface (S500, S300, TCR, remote T-SOLSA) running V2.0 (or later) software. 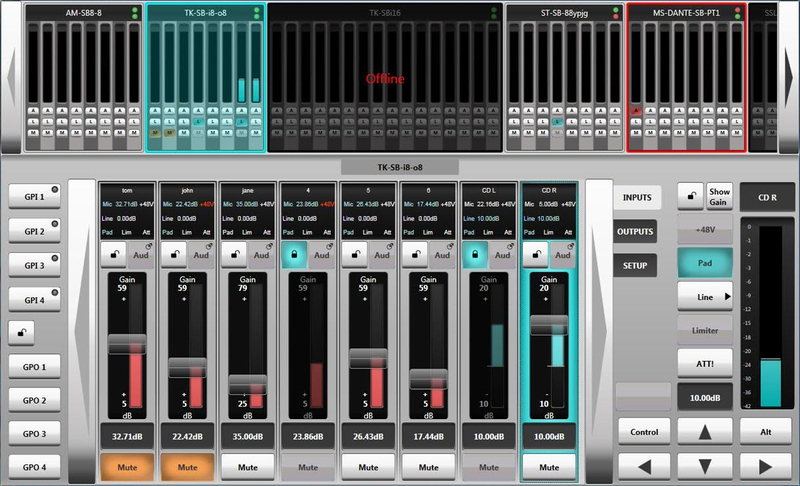 TCM1 brings MIDI and LTC hardware connections to System T, enhancing System T capabilities in broadcast music production and post production studios. It also provides additional GPIO and USB connections for use with your control surface. The front panel provides MIDI IN, OUT and THRU connections, LTC IN and OUT connections, GPI and GPO connectors plus two USB ports. On the rear are redundant PSU connections and the USB connection to your control surface. The control surface connection can be extended with external USB to RJ45 extenders if required.